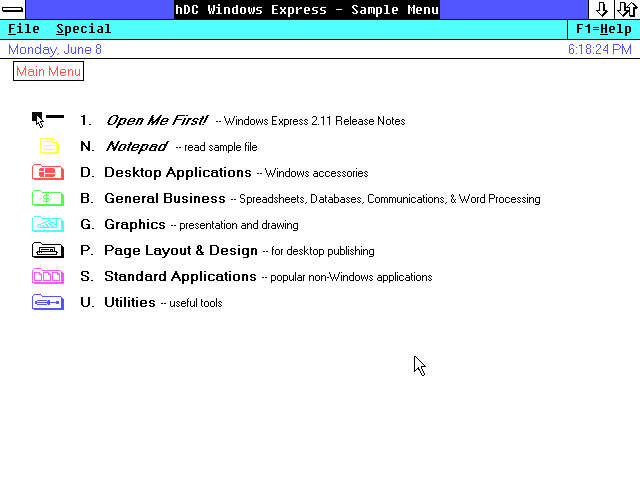 hDC Windows Express 2.11 is a customizable menu system designed for Microsoft Windows 2.x. It provides a hierarchical menu with large clickable menu items, and colorful icons. 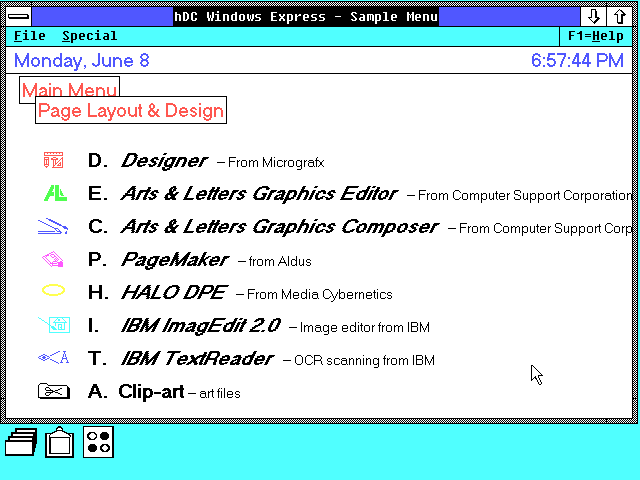 It was usually sold alongside hDC Windows Manager - a set of general purpose tools, and hDC Windows Color - an enhancement that enables Windows 2.x to use all 16 VGA colors. 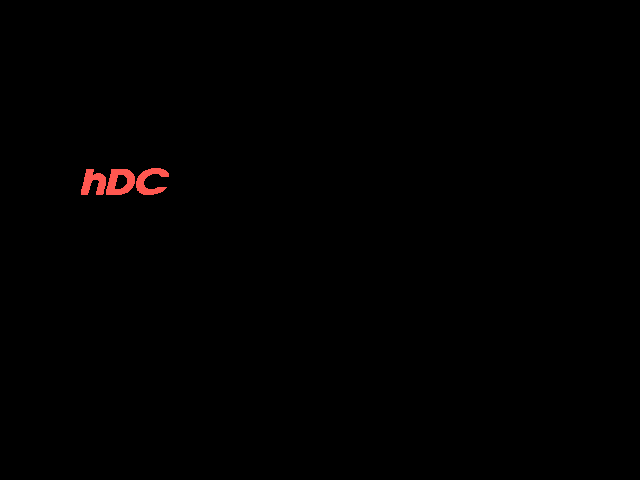 hDC Windows Express is just a menuing program with no file management capabilities. However, you can use it as an alternate Windows shell. Just setting up hDC Windows Express was interesting. 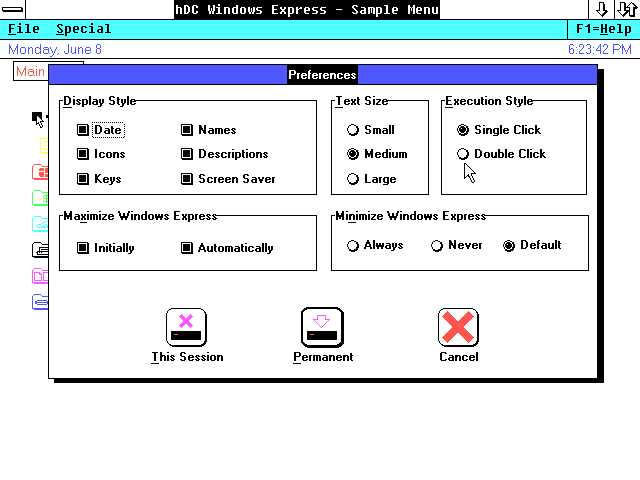 Most Windows 2 applications used various DOS based setup tools. However, this software is installed through a native Windows setup program. This version was released near the end of 1989, not that long before Windows 3.0. 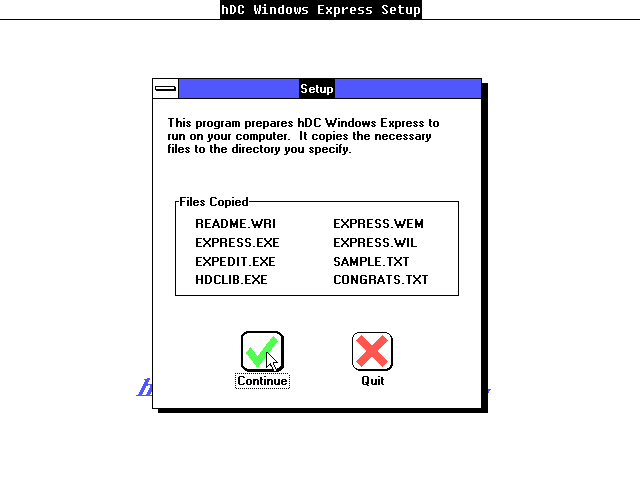 This is hDC Windows Express. The advantage of using Windows Express under Microsoft Windows 2 is that you no longer have to browse through directories in the MS-DOS Executive to find your application programs. 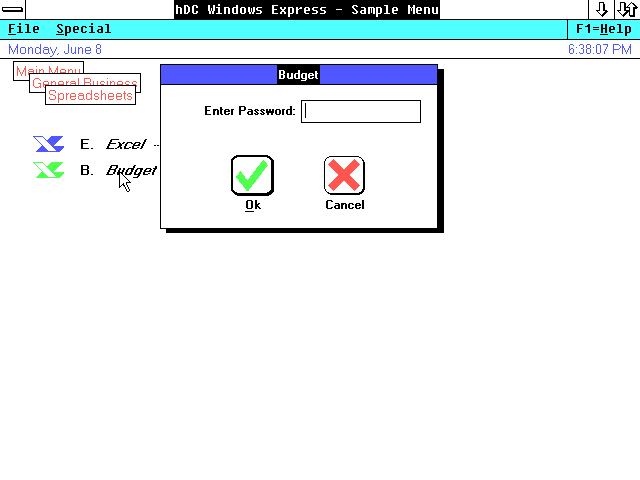 It comes pre-configured with a sample menu that lists many DOS and Windows 2.x programs of the day. Each menu item has an associated icon, a selection key, item name, and description. The menu items are organized in a hierarchy. The upper right corner displays a set of "tabs" to indicate your location in the hierarchy. It also conveniently displays the time and date. You can pull up additional help for the specific item by holding down the CTRL key and clicking on it. Oddly, there is no other visible way to get that. The F1-Help box brings up general information about using the program. From the File and Special menu, you can run a program, exit Windows, set preferences, or format a disk. Instead of launching a program directly, a menu item may first prompt you for a specific document. Since Windows 2.x did not yet have common dialog boxes, this creates a uniform way for you to open documents. You may also add commonly used documents in to the menu itself. You can set a menu item to ask for a password. Of course, this only prevents someone from casually opening the menu item. It offers no actual security. hDC Windows Express also has a built in screen saver. Due to various limitations the screen saver does not run when other applications are active. You can customize what elements Windows Express displays. Oddly, you can set it to display nothing at all. You can set the menu font to a larger size. Windows Express also has special font handling specifically for CGA graphics.